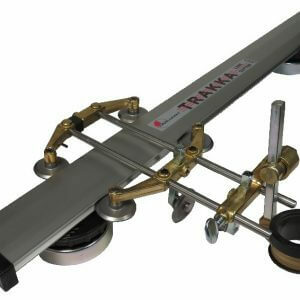 Tanjant Tool Co builds the absolute world best guides for gas cutting. The solid brass Gas Roller Guide (also known as Chariot Cutting Guide or Torch Buggy) is available as precise profile fit by selecting the guide that fits your gas/oxy-fuel torch from the Torch Brand/Model List, Part No’s TJ1602 to TJ1699. 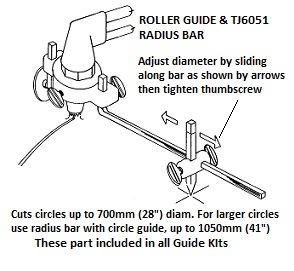 Another option is TJ1601 which is multi-fit by using 3-way screw clamping – fits gas torch tip nozzle diameter up to 18mm (11/16”) and with 12mm (1/2″) of parallel vertical section under tip retainer nut. See more detail with “How to Use” button and Picture Gallery. Using Tanjant’s roller guide when gas/oxy-fuel cutting saves time and effort, minimizes clean up and delivers real benefits well into the future.